Ambrose Worthing is no gentleman. He's a proud coldhearted rake who's determined to stay a bachelor forever. He enjoys bedding a different woman every night without the risk of falling in love. When he hears about a wager over the seduction and ruination of the daughter of his father's best friend, he knows he must intervene. Committing himself to the bet, he agrees to seduce Lady Alexandra Rockford-for her own good. He never expected the lady in question to be a beautiful, fiery creature who has passions of her own that call to his guarded heart. Alexandra Rockford has sworn off men, her heart still broken from the false promises of a childhood sweetheart who left her to marry an heiress. 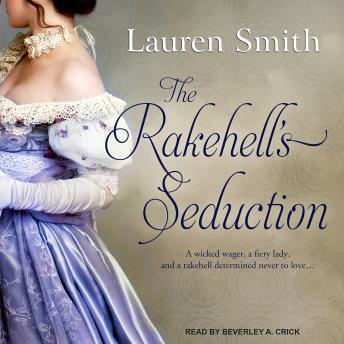 When she stumbles into Ambrose outside of a country ball, she knows the rake is trouble. His smile, his touch, his forbidden kiss are all too tempting, but being with him would ruin her. Determined to enjoy herself without falling in love, Alex can't help but let her defenses down with the too charming rake. But when she discovers Ambrose is seducing her to win a bet, it will take everything Ambrose has to prove to her that he is worthy to love her.